First In a wide bowl mix all the ingredients for Kofta - Paneer, potato,chilli powder, garam masala,salt, milk powder and mix well to stiff dough. Then shape them into oval or ball shaped kofta. 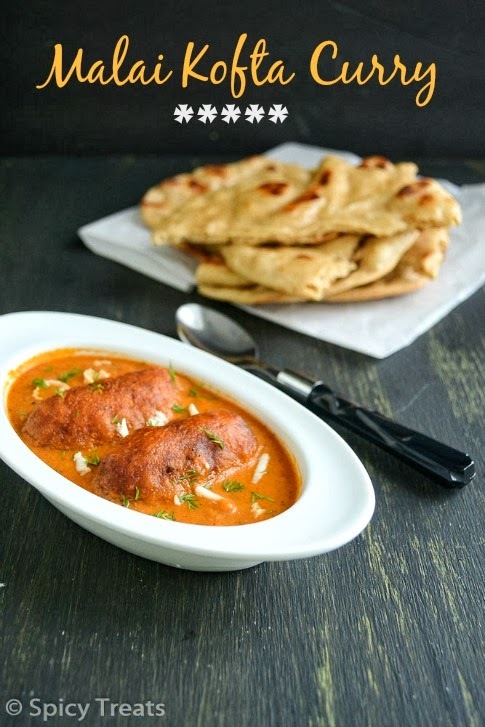 Heat oil in a pan to deep fry, gently roll the kofta in corn flour and drop it in hot oil and fry in medium heat until golden brown on all side. Drain in paper towel and keep aside. Then heat oil in a pan add clove, cinnamon and cashew nuts fry well then add ginger, garlic and onions and saute for 2-3 minutes in medium heat. After that allow this mixture to cool and blend it to a fine coarse paste and keep ready. Now heat oil in a pan to make gravy, when its heated add onion paste and tomato puree and stir well and cook in medium heat until the oil starts separating or for 3-4 minutes. Then add chilli powder, turmeric powder,garam masala powder stir well and allow the gravy to boil. And now add enough salt, 1/2 to 3/4 cup water and bring it to boil and add kasoori methi and simmer for a minute. Lastly add cream or milk, stir gently and simmer for 1-2 minutes. That's it..creamy and delicious Curry ready. 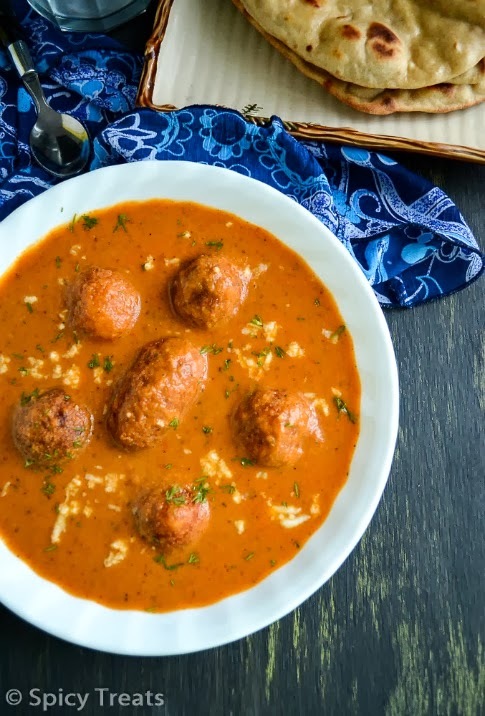 Transfer the gravy/curry to the serving bowl, arrange the kofta and garnish with shredded paneer, cream and finely chopped cilantro. 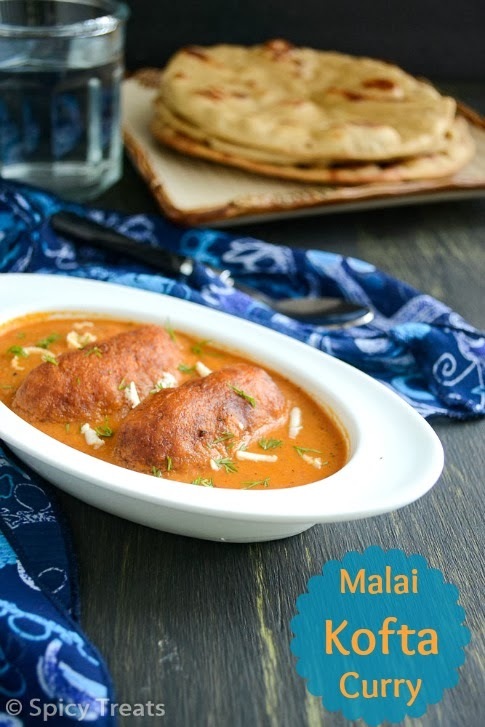 Serve with any flat breads or Jeera or Saffron Pulao. We had it with Tandoori Roti(Recipe coming soon). Take tomatoes in a sauce pan with enough water and bring it to boil, when the tomato skin starts peeling and it gets tender. Remove from the stove then transfer the tomatoes to a bowl filled with ice cubes and ice cold water. Let it sit for few more minutes, then peel the skin cut and remove the center seeds part and blend the rest of the tomato to a fine puree and use it in the recipe. I used whole milk, you can also use evaporated milk or heavy cream or half and half. I also add 1/4 tsp of Kashmiri Red Chilli Powder for extra color. 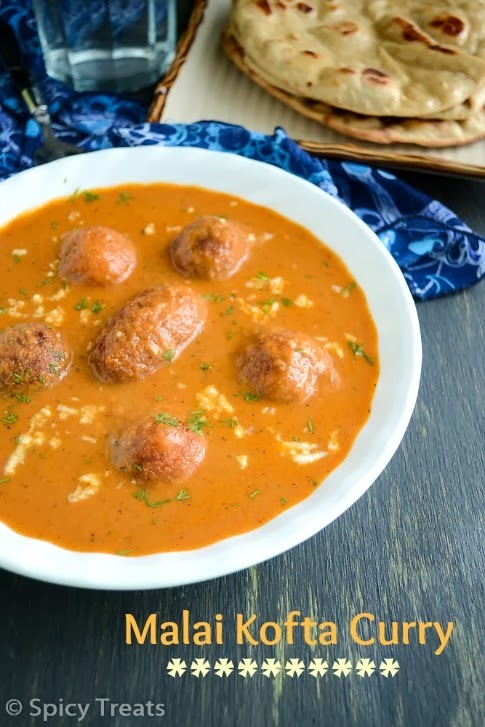 Add the koftas just before serving, if so.,heat the gravy for few minutes then add the fried koftas and serve. I deep fried the koftas you can shallow fry or cook in paniyaram pan also. Make the gravy little thin, because of cashew nuts addition it thickens after cooling. Looks very awesome Sangee, it has come out perfectly, yumm..
yummy.. perfect with all flat breads..
Kofta looks yumm.. Nice colour. Nice tempting clicks.